Mary Ann Dozer fell in love with fish, not while casting from a riverbank, but while scuba diving in the Caribbean and South Pacific with her husband, Dave. Her first fly fishing experience was in 1995 in Yellowstone Park and her passion for the sport took hold. When her high tech career wound down after 20 years, Mary Ann wanted to do something different with her life. The answer was easy: pursue her passion for fly fishing and share it with others. Mary Ann has been teaching & guiding for over 10 years in Oregon and Idaho, logging an average of 150 days/year on the water. She guides full-time in Central Oregon for the Fly Fishers Place in Sisters, Oregon. 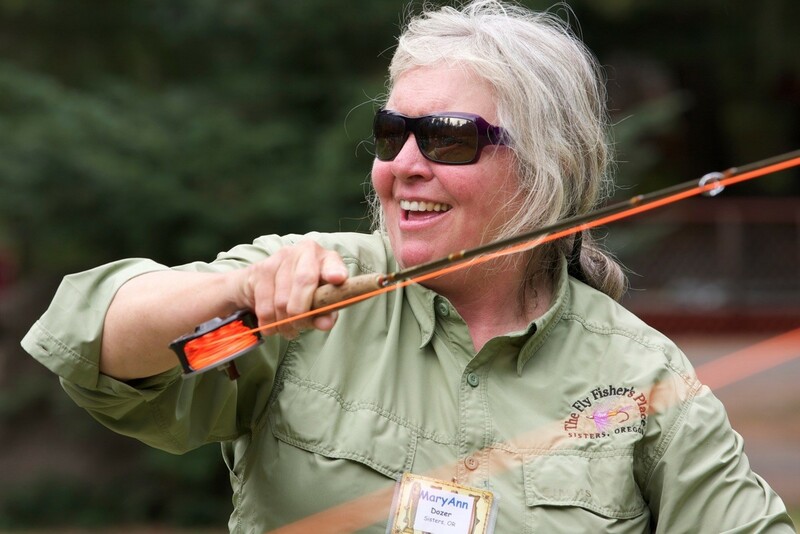 Mary Ann loves to introduce new anglers to fly fishing or take anglers’ skill to that next level. Whether this is via casting lesson, a day in a classroom, or a day on the water. Mary Ann considers casting an art form. She is adept at combining her responsibilities as a guide and teacher of our sport. She is known for her enthusiasm and expertise as a teacher. Mary Ann is an International Federation of Fly Fishers (IFFF), Master Casting Instructor and is pursuing a Two Hand Casting Certification. She is a member of the Casting Board of Governors. Her love and finesse of casting have put her on the Winston Pro-Staff Team. Mary Ann believes in giving back to motivate others to pursue their interest in fly fishing for the International Federation of Fly Fishers at the local, state & national level. She leads the IFFF Women’s Program and has also co-chaired Education and Publicity for the Northwest Fly Fishing Expo for the last ten years. She is the Monthly Programs Chair for the Central Oregon Fly Fishers Club. Mary Ann is deeply committed to supporting Casting for Recovery and has volunteered for events across Washington, Oregon, and Idaho for fifteen years.